Could you sponsor one of our many permament residents at Whitehall. Dogs come to us sometimes and cannot be released. This may be because they have suffered too much abuse and have too many behavioural problems or have severe medical conditions and on-going vet fees, or simply that no one ever came for them. We work hard to provide the very best facilities for our permament residents. We try to make their lifestyle as close to a home environment as possible. This costs a great deal of money in food and staff and vet care. Could you help keep one of these dogs in Whitehall by sponsoring them from as little as £1 per week. Whitehall is their home now, they deserve the best we can offer them. In return for your donation we will send you an information pack including photos of your sponsored dog. Below is the list of dog which you may choose to sponsor. If you are interested in sponsoring a dog please email us on whitehalldogrescue@yahoo.co.uk for further information or a standing order form. Ellie the Rottweiler came to as an unwanted puppy. She had not had her vaccinations and within days of arriving at Whitehall Dog Rescue she developed Parvovirus and had to be raced to the Vets. She went downhill very fast and it was suggested that Ellie had gone downhill so much that it would be best to put her to sleep. This is a very difficult decision with any dog, but especially so with a 9 week old puppy and we persuaded the Vet to carry on her treatment for another 12 hours. We are so thankful that we did because as you can see she pulled through. We then re-homed Ellie to the Receptionist who worked at the Vet as she had seen her every day struggling for life and had fallen in love with her. Sadly, the receptionist split up with her husband a few years later and, believe it or not, put Ellie in a Boarding Kennels and didn't go back for her. (We tell everyone that takes on a dog from Whitehall Dog Rescue that if things don't work out throughout the life of the dog that the dog must come back to us). Fortunately for Ellie the Boarding Kennels that Ellie was staying at had rung us to see if we had a place to take Ellie in and it was only when we got talking we realised Ellie was one of our former rescue dogs and made a place for her to come back into us. Ellie came back to stay as a " Permanent Resident". Keavie is a Whippet cross that came into us with another dog called Bobby that had both come in from a broken home. It is always very difficult finding homes for 2 dog's to be re-homed together, so we had to make the decision as to whether we let Bobby and Keavie go their separate ways. A nice home came forward for Bobby and so Keavie remained on our website for sometime after but again it is difficult to find homes for our senior dogs, so we took Keavie off our re-homing list and let her join the "Permanent Residents Club". Sadie was thrown out of a car over a motorway bridge on Rein Road in Morley. She fortunately hit the grass embankment and got away with two broken legs, broken ribs and a punctured lung. She was spotted by a man called Alan Catterick, who was a Police Dog Handler and was out walking his pet dog "Toby" that he had adopted from Whitehall Dog Rescue. Alan rang Whitehall at 2am to see if we could help this young dog and we came out to see a very shocked and frightened dog. We took her to the Vets and were advised that it would be kinder to put her to sleep, but we felt because of her age (approx 5 months old) that we just had to give Sadie a fighting chance and the Vet agreed to put her on a drip, give her painkillers and see how she was to go on over the next 24 hours. Sadie went from strength to strength, but had to have many operations to repair her damaged legs. Sadly her rear leg was causing problems despite the vets best attempts to save it, so a decision was made to remove it. Sadie was determined not to let this slow her down and appeared on Calendar TV only a month or two later chasing & catching her Frisbee! 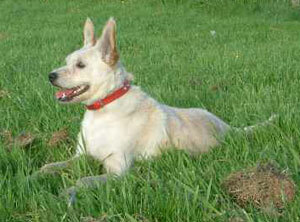 Sadie now lives at the Rescue as a permanent resident, keeping an eye on all the comings & goings! This is our Ruby. Ruby came to us in a terrible state. She had been kept in appalling conditions and was seriously underweight and malnourished. Ruby was immediately taken to the vets. Several procedures later it was discovered that ruby had a piece of string attached around her stomach preventing her from digesting any food. 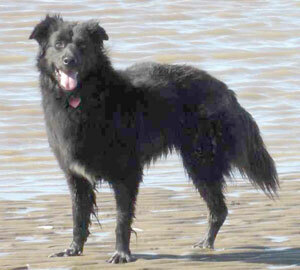 The outlook was not good for our Ruby and the vet deliberated as to whether it would be kinder to put Ruby to sleep. After many phone calls and specialists it was suggested that Ruby may have a chance if she underwent a very risky operation to remove the string and a large quantity of the intestine. This operation had to be done in London by the Royal Veterinary Hospital. Unfortunately by this point Ruby had deteriorated so badly that she was chronically anaemic and a full blood transfusion had to be done before she was able to travel. Brian set off at ten o clock that evening to London Veterinary College with Ruby. She was booked in as an emergency. Her chances of surviving the journey were slim and she had only a 5% chance of surviving the operation. Miraculously, Ruby survived although she was nowhere near in the clear. It took a further two operations in London and another blood transfusion to get Ruby back on the mend. Ruby is now on medication for life but has made an amazing recovery. She has joined the Permanent Residents Club due to her ongoing conditions. We always joke at the rescue about Ruby being the happiest dog we have ever seen. This is so true! Ruby never stops playing and having fun. She loves all people, even the vets with whom she is famous for her miraculous recovery and beautiful temperament. Ruby loves attention and has a big kiss for everyone. Ruby is our showcase dog to help us, as a rescue, educate people on the true virtues of the Staffordshire Bull Terrier breed. You can often see us with Ruby at our Pets At Home collection days which she loves going on. 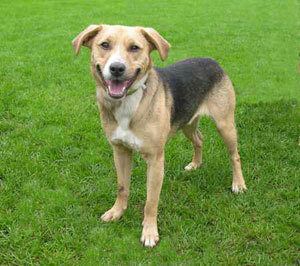 Dexter is a dog that was found wandering the streets and was frightened of his own shadow when he first came into us. Because of this we felt Dexter had been mistreated and it took a considerable time before he started to trust people again. Dexter came to stay with us at the Rescue after we found he had a particular dislike for young lads wearing baseball hats and would, if he had been allowed to, have attacked them. So here at Whitehall we do not believe a healthy dog should be destroyed because of a problem that renders that dog unre-homeable. So Dexter joined the Permanent Residents Club here at Whitehall Dog Rescue. The biggest problem that we have with Dexter is that he wants to be wherever we are and no fence will hold him back no matter how high it is, so we have now nicknamed him "Houndini". Ted is a dog that was hit by a car whilst straying resulting in injures to his rear leg. This was too badly damaged and the decision was made to amputate the leg. From that day onwards Ted has never missed that leg and goes everywhere at 100mph. (If he had a driving license he'd be banned after a week!! Ted became a "Permanent Resident" due to a very special Dog called Civic that lived on the streets of Leeds (behind the Civic Hall) who for many years had evaded capture by the Leeds City Council Dog Wardens, who in turn had rung me to see if I could catch Civic. Believe it or not it took 3 years after that phone call to catch him. At that point Civics health had gone into decline and our Vet felt that if he hadn't have been caught he would have died within weeks. We got Civic nursed back to health but Civic had spent so long without Human contact that he was virtually a wild dog and we spent 6 months trying to get Civic to have a lead put on, but no way was he having it. We tried him with other Dog's but he would only try to attack the other dog's. Then one day Civic was having his kennel cleaned and shot past us to the kennel that "Three Legged Ted!" was in and started wagging his tail as if he'd met an old friend. So we let Ted out of his kennel and they just instantly became best mates. We put Ted on a lead and then Civic and for the first time in 6 months, Civic went out for a walk with us. From that day on, they were the very best of friends and went everywhere together. 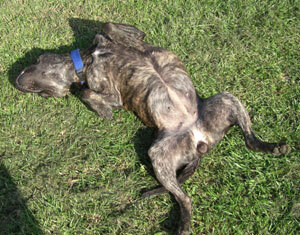 Civic lived at the Rescue for 8 years with Ted until Civic sadly passed away in Feb 2009. It took Ted some time to come round from the sad loss of his best mate as they truly were best mates (we nicknamed them "The pair of nutters!). But as with us all life has to go on despite our losses and Ted has new mates at the Rescue, but we don't think he'll ever forget Civic and neither will we.